If you’re like me, you document most of your life, daily experiences (read: outfits) and funny things you see along the way in picture form. One of my favorite things to do is to scroll through the picture app on my iPhone and giggle at my past adventures. The photo apps currently in heavy rotation for me are Instagram, Pano and PicFrame. If you’d told me I’d need another one, I’d tell you I needed a hole in my head instead. Or more shoes. After demo-ing a few short months ago on stage at TechCrunch Disrupt in now-discontinued iPad form, Mixel’s pivot to iPhone makes the concept much more accessible. 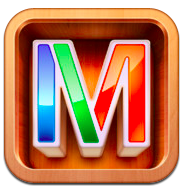 It allows you to take photos from your various social portals and use them to create shareable collages. 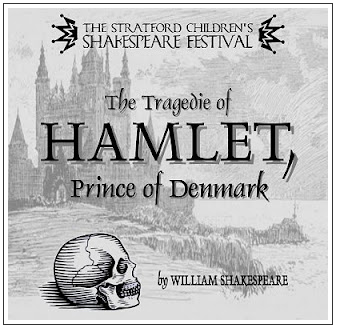 Simple approach, creative and exceptionally well-executed. And downright fun! The app is incredibly easy to use. Sync your Facebook, Instagram and photo stream with Mixel and you’re well on your way. To make your collage, you select the shots you want to include, shuffle the Mixel-generated arrangement of images and choose the style, which is essentially a filter. There’s always a filter these days, isn’t there? Again, all of this is really easy — resizing, shuffling, rearranging. Each aspect of the UX is really well thought out by the Mixel team. When you publish to Mixel, you also have the option to share across your various social networks. There’s a lot of activity within your Mixel Inbox where you can follow your friends who use the service, popular images and manage any unfinished collages. Occasionally, the app freezes after posting my collage. It doesn’t crash entirely, but it is annoying nonetheless. Bugs like that are common in the first days after a launch, so I’m patient until the fix comes. There seem to be a lot of ways the team can grow the service. Some suggestions I saw via Twitter were to make a collage sizable for Facebook cover images or Instagram ready. Both of these hacks would extend the reach of Mixel, which is obviously a smart direction. Adding integration with key popular apps is a nice goodwill gesture, especially considering everything recently. Because of the simplicity and novelty of creating a collage out of my existing pictures, I’ll now have another photo app in rotation. Because, honestly, who doesn’t need more fun? And filters! When I moved to San Francisco back in 2005, I did it sans car. If you can believe it, I’ve been personal vehicle-free ever since, favoring our fair city’s delightful mass transit system and traditional city cabs in order to make my way around. I’d walk more, but I wear heels, so that’s out. For four long years, Muni and SF cabs and I coexisted in a relationship fraught with tension. Neither one of them thought it necessary to show up on time (or at all), even though I continued to express my boundaries: “Adhere to your schedule, arrive when I call you and get me places safely.” Something had to give. Luckily, several entrepreneurs were thinking exactly what I was thinking and lo! Uber, Lyft and SideCar were born. And thus, they were reviewed. And it was good. In order to judge each San Francisco taxi disruption service effectively, I took the same trip on three different occasions taking into account the mobile experience, drivers and rates. Below are my findings. I was initially nervous about trying Lyft. Considering it was someone’s personal car, driven by that particular someone, I was tentative. 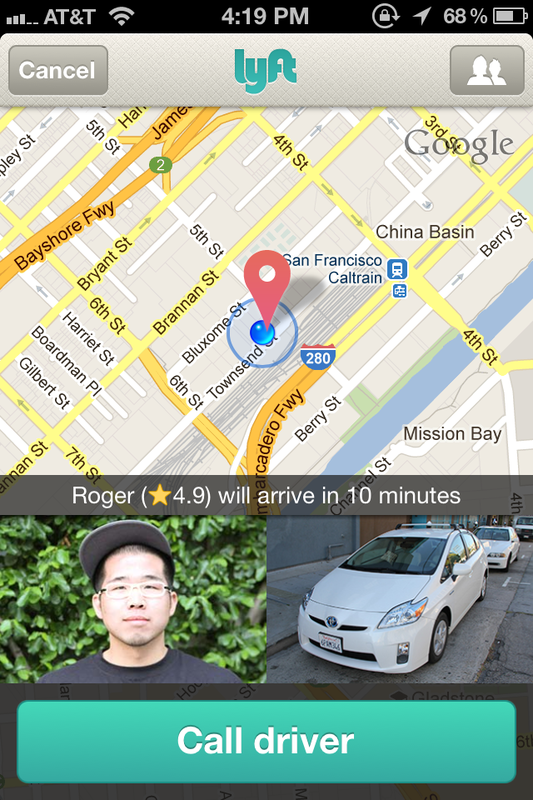 To counter my anxiety, I chatted Roger’s (4.9 stars, drives a white Prius) ear off the entirety of our journey. Shocking, I know. The in-app experience is as seamless as the in-car experience, with the exception of fewer available drivers overall than exist with other services. Like other car services before it, Lyft just requires your location and provides an estimate on when your driver will reach you. The app doesn’t automatically adjust to my current location which is slightly annoying, but easy enough to deal with. Roger was a good driver, got me to my appointment safely and good-naturedly answered my incessant questioning about the service. (We may or may not have had a philosophical conversation about the lyrics of “Call Me Maybe” which came on the radio during the ride.) The best part, aside from the traditional end-of-ride Lyft fist bump, was the fact that the ride cost $11, plus tip to total $15. No actual money was exchanged as the app keeps my credit card on file, prompting me to add a “donation” to the final bill — that’s Lyft’s lingo for the tip. Fears for my safety allayed, I’ll be trying Lyft again. Plus the cars all have big, pink, fuzzy moustaches on them. Really! If the concept of Lyft concerned me, then SideCar was especially challenging. SideCar’s drivers are ordinary people just cruising around the city on the off-chance that you need a ride. Meaning they aren’t professional drivers which is why it made me a tad concerned to try the service. Another difference with this service is that the ride payment is “voluntary”. 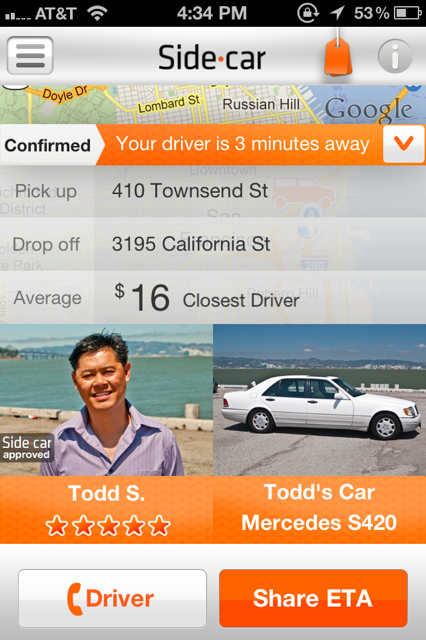 SideCar asks that you enter your destination and if a driver is headed your direction, they swing by and pick you up. The app shows you an estimate of how much other riders have paid for a similar trip, and you can pay that much or less depending on your experience. Mine was $16. My driver was Todd (five stars) who zips around San Francisco in a Mercedes. He lives in Palo Alto, coaches middle school volleyball and in his spare time is a full-time SideCar driver. The app is very… orange. It doesn’t feel as polished as Lyft but it gets the job done. Like these other services, it keeps my credit card on file and that’s how the payment is made once the ride is over. Todd was a good driver and excellent conversationalist but he took the scenic route to get to my appointment which took longer and made me late. I chalked this up to him being a civilian rather than pro driver. One positive is that there are a lot of drivers available with SideCar, so wait times are pretty minimal, at least downtown. Bottom line: due to the fact that SideCar drivers aren’t actually professional, I doubt that I’ll use it again. As an Uber user since September 2010, I’m a devotee who can’t say enough good things about the service. Full disclosure: I take 4-5 traditional Uber cabs a week. Pretty sure I have a problem. But anyway… UberX was a new experience for me. 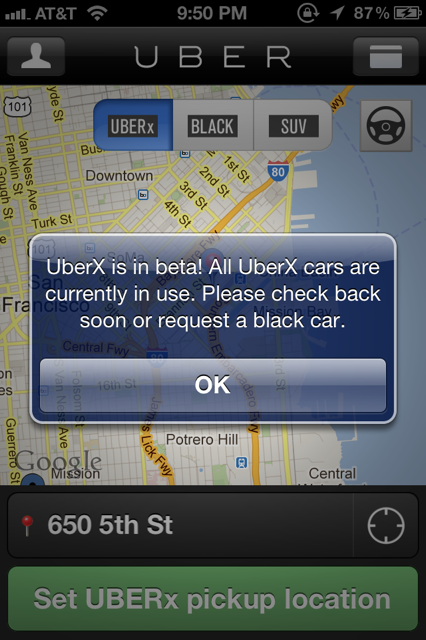 UberX is the Uber team’s answer to the low-cost ride share services that cropped up after the advent of Uber. The cars are roughly 35% cheaper than the traditional town cars. Currently in beta mode, you can request an invite and try out the service if approved. Like Lyft, there aren’t a lot of UberX drivers available. More often than not I get this notice when trying to hail the service. For those unfamiliar with Uber, the in-app experience is uncomplicated, only asking for your location, showing available cars in the area and estimating the amount of time it will take to reach you. Lyft’s app seems to mimic this in its design. What’s that they say? Imitation is the most sincere form of flattery. My driver was Vinh (five stars), a very nice young man who was thrilled to be driving for Uber. He’s been very busy since the service launched and thinks Uber clients are the best. He drove a silver sedan and got me to my destination safely, efficiently and happily. The ride was $16. Honestly, I prefer Uber to any of these other car services, but since my initial Lyft ride I’ve used that service several times, plus my typical traditional Uber. I’ll leave SideCar and UberX to more adventurous souls. But try them! I’m curious to know your experience. A blind squirrel finds a nut every now and then, as the New York Times proved when they ran this piece on successful women in Silicon Valley who also care about fashion. Long have I judged myself for my innate interest obsession with all things stylish, fearing that if I cared as much as I do then I wouldn’t be taken seriously as a professional. It appeared extreme at the time: I could either be stylish or I could be successful. No middle ground. As I’ve matured, I’ve come to realize is that my style is as much a part of my brand (if you will) as my profession is. It is just one of the many components used to build the whole person that is me, and embracing that is an enormous part of living in self-acceptance. So then I continue to wear bright colors with abandon (pants in particular), delight in fabrics, accessorize rather than exercise, adore footwear, all the while loving tech and my hobbies; thriving in my occupation and personal life at the same time. A multi-faceted Leslie is who I am and acceptance of that is key to my success as a human being. To my own self, I am true. Although I adore Apple products, I have long hated their Safari browser eschewing it for Firefox and then with the advent of Google’s browser product, choosing Chrome. The only place I could not avoid what I found to be an insufferable browser experience was on my various Apple mobile devices. No longer! 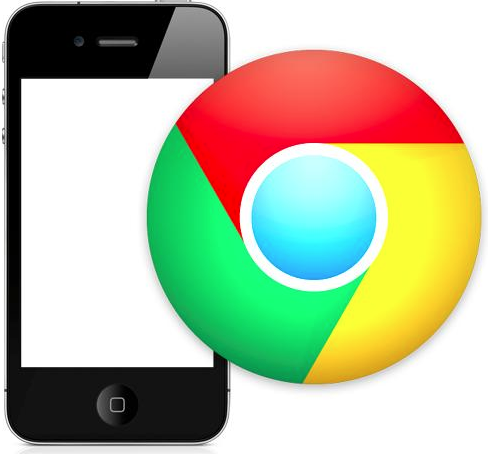 Google announced Chrome for iOS during the I/O conference and there was much rejoicing. I am so excited about it that immediately upon downloading, I replaced the Safari app with it on my home screen. Aside from the benefit of not being Safari, the app boasts several features which make it especially appealing to me: Incognito Search Tab and Other Devices. The Other Devices feature was made just for little ol’ me, or so I like to believe. 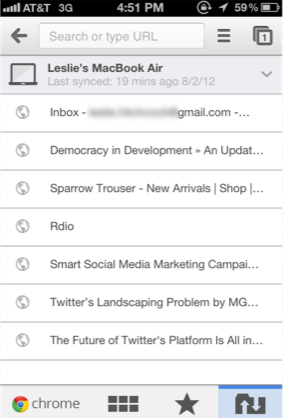 At the moment I have roughly 20 tabs open in my Chrome MacBook Air browser. Several have been open all week because I haven’t had time to do a lot of extraneous reading as of late. (I’ve been busy.) Because I don’t want to abandon all hope of reading some insightful industry pieces (MG and ATD) or online shopping (Sparrow Trouser from Tibi, size itty-bitty please), Chrome automatically synching them between all of my various Apple products is genius. Where in the past I would have to add these links Evernote, now I can just leave my browser open and more easily access webpages where I left off, saving Evernote for the pieces I really want to keep. Also, because of this feature, Chrome remembers the things that I search for across all of my devices, auto-completing my most typical searches saving me precious seconds in finding whatever is so pressing at that moment in time. 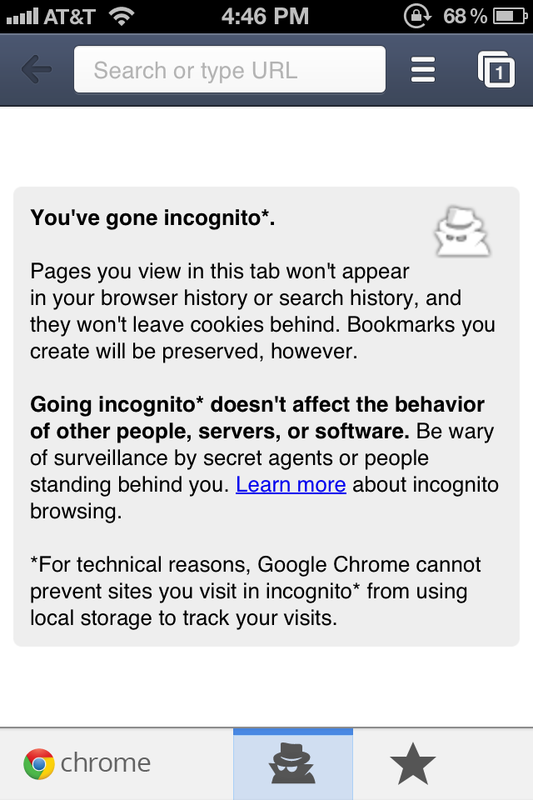 Which leads me to “Incognito Search”. Let’s be honest: unless I’m completely alone here (and I don’t think I am) we tend to search things on the mobile web that we’d dare not look up on our laptops. My theory as to why this happens is that I’m on the go, have the internet at my disposal and tend to be discussing ridiculous things that obviously require more context with my friends while we’re out and about. Because I clean my Safari search history out regularly to avoid potential embarrassment, I don’t have great examples of past bizarre searches to share with you — or I totally would in the interest of transparency. But I will tell you that once a boyfriend was sharing his iPhone screen with me, launched Safari, started a search and the first thing that popped up was a query for his ex-girlfriend’s Twitter feed. As you can imagine, that was a fun moment. I digress! The Incognito Tab saves us from ourselves and awkward moments like that by eliminating the history trail. Hooray! You can search for more information about the strange things you think about while away from your laptop and look up your ex’s Twitter accounts to your heart’s desire. I just don’t have to know about it. Bottom line? Great app experience, Google. Hopefully Apple will see that Safari can afford to change and be more user-friendly/less embarrassing. My only gripe is that I cannot make Chrome my default browser on my iOS devices without jailbreaking it.